Neglect is the most common form of child maltreatment in the United States and manifests in many different forms such as educational, medical, physical, or emotional neglect. 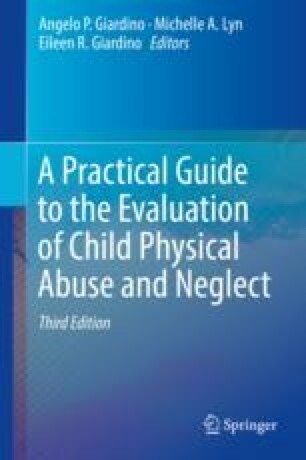 This chapter identifies, defines, and elaborates on neglect in childhood as well as its effects on children and their growing bodies. Certain cultural and economic factors also influence our views of childhood neglect and should be considered when treating this vulnerable population. Failure to thrive (FTT) is a well-known phrase in pediatrics used to describe children who are poorly nourished and are failing to grow and develop normally. This chapter further explores the diagnosis and management of FTT as well as offers several real-life examples for further discussion at the end of the chapter. Neglect and FTT may exist either independently or concomitantly; however, both entities affect a child’s physical and emotional well-being and should be quickly diagnosed and effectively treated so as to minimize their harmful effects on the growing child. Mehta, N., Corkins, M., Lyman, B., Malone, A., Goday, P., Carney, L., et al. (2013). Defining pediatric malnutrition: A paradigm shift toward etiology-related definitions. Journal of Parenteral and Enteral Nutrition. https://doi.org/10.1177/0148607113479972. U.S Administration for Children & Families, Child Maltreatment 2015. https://www.acf.hhs.gov/cb/resource/child-maltreatment-2015. Accessed 17 July 2017.